The plague is not what it used to be. Once a monstrous killer, it dispatched thousands and thousands of victims, its first symptoms almost always meaning the death sentence. Now, easily treatable with antibiotics, it surfaces only in few isolated cases each year. Even so, it still makes the headlines. It appears that humanity has not forgotten its great enemy and we still stare with fascinated horror when it strikes. What was it exactly that turned a mass murderer into a low-profile troublemaker? Medicine, of course, but there's more to the story and The Plague Race beautifully explains the details. When the plague struck in Hong Kong in 1894, two microbiologists, Alexandre Yersin and Kitasato Shibasaburo, hurried to the danger zone to find source of the disease and the cure. Mindful of the international fame that awaited the future 'plague conqueror', they chose competition over cooperation. The 'race' had begun. This story provides more than enough material for a decent medical thriller, but Marriott does not stop there. He incorporates other plague epidemics into his narrative, some of them from centuries ago and some quite recent, turning The Plague Race into a fairly comprehensive study of Yersinia pestis. 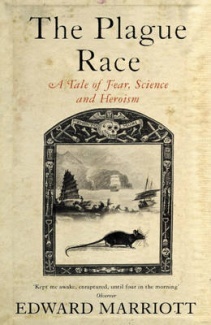 See, I can't make my mind up whether The Plague Race really deserves to be called non-fiction. On one hand, it is firmly based on sources (Yersin's diaries, old newspapers etc.) and illustrated with authentic photographs. On the other, the book is so brightly coloured up for drama that scientific objectivity somehow gets forgotten. I'm inclined to call it a very well researched historical fiction. Whatever its genre, The Plague Race reads like a dream. It is smooth, fast-paced and full of fascinating trivia that you'll be able to scare/impress your friends with forever after. Enjoy.